This article entitled natural colic relief aims to provide you with a very effective way of curing colic instantly and naturally. Colic is officially defined by the “Rule of Threes.” The rule of threes means a baby is otherwise healthy and well-fed (i.e. is gaining weight and exhibits no signs of illness); but has episodes of crying, irritability and fussiness that last up to or more than three hours a day, occurs at least three or more days a week and for more than three weeks in a month. The symptoms of colic include drawing up their legs, passing gas, sleeplessness and a red face. If your baby is showing signs of colic, do not panic. It may seem as though there is nothing you can do to treat colic, but this is not true. One of the main reasons why colic is proving so difficult to cure is because most times, the remedy is not aimed at the cause of colic but the symptoms of colic. Herbal remedies and homeopathic medications work to relieve the discomfort of a gassy or bloated tummy but do not treat the cause of this gassiness. 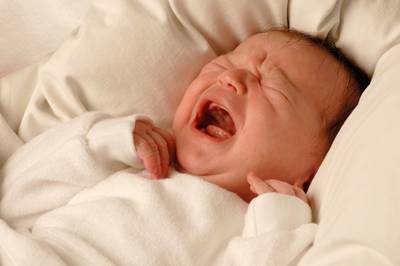 So what is the cause of colic and why do so many babies suffer from it? The cause is actually much more obvious than we think. The birth process is an extremely stressful experience for both mum and baby. Many babies are traumatized by this experience and this causes an imbalance in their nervous system. Any adult who has experienced a stressful experience will be able to tell you how the body starts acting up when under stress. Most commonly, heartburn, indigestion, hair loss, bowel problems and difficulty sleeping are reported. Taking heartburn medication and sleeping tablets simply treats the symptoms and does not deal with the underlying problem-stress or an imbalanced nervous system. So now that you understand what your baby is going through, lets look at how you can help your baby by re balancing their nervous system. Adults take up meditation, take up different forms of exercise and some even go for counseling therapy. What about babies? Because the babies nervous system is still maturing, it is very easy to instill balance. The earlier you do so the better! Wish there was something you could do? Well…there is. It is called Baby Bowen. Baby Bowen is the best natural colic relief you will find. The best part is you can learn Baby Bowen so easily! With just 5 gentle and simple moves, you will be able to heal your baby! Find out more about Baby Bowen Here. A Little of What You Fancy – Let Us Enjoy Eating Cake ! My oldest had colic. Back then there wasn't much we could do. Her doctor put her on soy formula but I don't know if it really helped with the colic. I wish I had this product 13 years ago. I would have been interested in trying this, too. My oldest was also colicky, and it made me feel insane. Horrible first-time-mommy experience, and I know it wasn't fun for my son, either. Reflux meds did help him. With my 2nd I tried gripe water, and I can honestly say it did NOTHING. Another huge help for us: babywearing. Wearing him in the moby wrap kept him upright more often, and it seemed to really help. Very informational blog you have, thanks! I am dropping by from UBP '10 and wanted to thank you for stopping in @ A Penny Saved earlier today to show the comment luv! Hope you have a terrific weekend! That's interesting. Something else to have in a colic arsenal beside Happiest Baby on the Block, a Breastfeeding Elimination Diet, and Di Gize Oil.